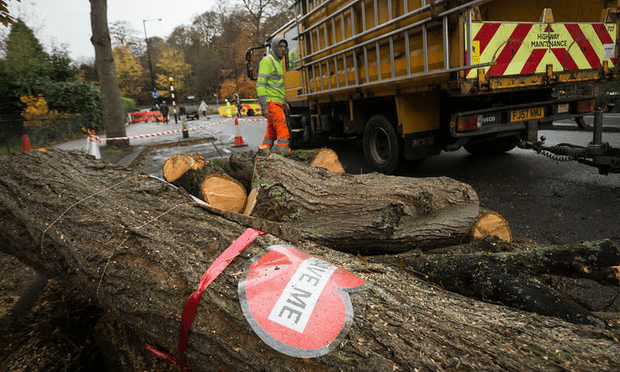 A ‘save me’ sign on tree cut down in Rustlings Road, Sheffield [Image: Danny Lawson/PA]. No, Nick Clegg, the fight for Sheffield’s trees is not like “something you’d expect to see in Putin’s Russia” – unless you’ve been to Russia recently and know something we don’t. TV viewers who watched the documentary Who’s Spending Britain’s Billions will know that Sheffield’s Labour-run council has contracted private firm Amey to maintain the city’s roads. Apparently, Amey promised the contract would “see Sheffield’s roads transformed from some of the worst in the country to the best in the country within the first five years”. But protesters say this is a front for a plan to chop down as many trees as possible, in order to spend most of the 25-year contract period with much lower maintenance bills than if they had been left in place. They say the trees are invaluable flood defences and are vital in countering air pollution – but that hasn’t stopped Amey from felling 4,000 trees since the contract was signed, working without proper consultation and motivated by profit. For shifty councillors, the joy of a contract with a private company is they never have to divulge the details to members of the public who submit Freedom of Information requests. But the tactic can backfire. Members of the city’s Labour Party are deserting it in big numbers, quoting the attack on the city’s trees and the council’s devotion to its contract with a company out to profit from it as the reason. Labour will suffer serious damage in Sheffield if its councillors are allowed to press on with this debacle. It doesn’t just reflect badly on them; it reflects on the Labour Party as a whole. And now UKIP has a new leader whose stated aim is to invade Labour heartlands, this Labour council is offering Paul Nuttall a ripe and juicy target. Of course, Nuttall and his party are nothing but a gang of single-issue sub-fascists who are lucky enough to have been able to attract the attention of the BBC and a few other gullible news providers/right-wing media moguls. They won’t win anywhere. But why erode confidence in Labour when there are possible threats around? The attitude of Sheffield’s Labour councillors is utterly unfathomable. Perhaps they need a telephone call from national Labour leaders, to remind them that they owe loyalty to the people – not profit. Council contractors and police had descended on a particularly desirable street … under the cover of darkness, “dragged” people out of bed to move their cars and detained peaceful protesters – “all to chop down eight trees”, he wrote in a local paper. I am from Sheffield and this was a deplorable act by Sheffield City Councilors, but that is not unusal in their dealings within Sheffield for in many respects they feel they are a law to themselves and have no respect to the populas of Sheffield. Amery should never have been awarded the contract, especially on a PFI basis, for now they can do as they please in the name of profit, whether this be for the good of Sheffield or not. PFI contracted should be made ilegal, as they were an ill thought out idea which Labour introduced,as while, they may have been a good way to initially introduce new introstructure,however, the penalty clauses that are contained within them should future changes be required creare enormous costs for those who have to live with the resultant situation. Profit to the few and no benefit for the many. PFI was introduced by the Conservatives in the early 1990s. I’m surprised people are still attributing it to Labour. Labour did take up PFI, on the advice of Treasury civil servants, after they found the Tories had left no money available for rebuilding the NHS and the education system in 1997. In hindsight, it was bad advice. This PFI contract, in Sheffield, seems likely to have been awarded in an attempt to achieve something despite the Conservative Government’s relentless squeeze on local government spending. It is usually employed in an attempt to mitigate Tory restrictions. This is what Labour councils are like up and down the country. They are the frontline in making cuts and passing austerity to people. How do you not see this? Of course, Nuttall and his party are nothing but a gang of single-issue sub-fascists who are lucky enough to have been able to attract the attention of the BBC and a few other gullible news providers/right-wing media moguls. They won’t win anywhere. Well the tories are a single issue party privatisation, labour are a single issue party errr well something, and lib dems are a single issue party say anything and do anything to get alitlle bit of attention, the greens are a single issue party lets go back to mediaeval times, the sap are a single issue party lets leave the UK but still get english taxpayers money to survive on, as for fascists I don’t think UKIP supports the Italian government of the 30’s and early 40’s. Although some of Mussolini’s aims such as wanting to get the trains running on time, which he never achieved are worthwhile. Oh dear. I think I may have touched a nerve there, folks. This is amazing, fascinating, and totally unsurprising. The book published in 2001, “What’s Wrong With Labour?”, by Paul Wallender (Merlin Press), gives an account, at its core, of the overall ineffectiveness of the Sheffield City Council during the ’90’s under David Blunkett’s leadership. Wallender is a native of Sheffield, and he paints a picture that puts this important article into a wider context. I once had a conversation with a Scotsman, told me trees are a bloody menace, slimy mess every year trodden into his house, full of insects and vermin, chop the bloody lot down, if they were meant to be in towns they would root in concrete! The only reason I mention he was a Scot, is it transpired he grew up on a famous Glasgow estate devoid of trees. I have since found many misguided followers of this mans philosophy. Most of the UK population now live in polluted cities, whose research & monitoring of the air proves pollution and flooding is reduced by tree’s. Indeed a respected organisation recently unveiled a government sponsored plan to plant millions of new trees to combat both conditions. Is there a remote chance that the councilors of Sheffield have not heard of this and also have this mindset? Somehow, I doubt it, but it would at least be easier to accept than having failed in their duty to properly audit the Amey contract, or worse, a case of councilors having a personal financial ‘interest’. How can I surmise this, well I can not see them taking action like this to save ratepayers money, if by doing so, they are acting against the very interests they purport to represent. Were I a concerned objector in Sheffield, I would examine the minuets of appointment to clarify the reasons behind the decision. The Council has shown us that just because they are a Labour Council, that they are in any way, better than a Tory run council. They’re just as shifty and contemptuous of people as the opposition. As for Nick Clegg – he’s shown himself to be not only arrogant but a total ignoramus, – perhaps a trip to Russia might edify him. Some trees, unless they are pollarded regularly, do cause problems with footpaths and road surfaces, but it is not necessary to chop them down since the shrinkage of the roots afterwards, can cause just as much damage re. subsidence. It’s just a stupid, cheap, lazy and uninformed way to deal with a problem. Do you mean “in NO way better than a Tory-run council”? PFI contracts are a nightmare long term solution that require quite astute commercial minds to see the wood for the trees which unfortunately Local Government and Civil Servants are notorius in not having that type of mind set. This is mainly because funding to them is a bottomless pit for which they have no responsibility or likely consequences. Decisions are usually protected by committee decisions rather than individuals who one could sack for their misdeeds. There are more than 250 parks, woodlands and gardens in the city, with an often quoted estimated 2 million trees, and claims of Sheffield having the highest ratio of trees to people of any city in Europe. Roadside trees however are currently being removed by the council under a controversial 25 year Private finance initiative scheme which commenced in 2012. The thing is, Sheffield’s character is defined by the way we share our space with trees. There are many tree lined roads and streets, all across the city. It makes Sheffield a wonderful place to live. These are not just “roadside trees”… they are trees that people enjoy everyday in the course of their normal lives without having to go to some specific “green space” to visit them. Trees that you walk under as you make your way to the shop, trees that give lovely shade in summer, that create beautiful displays of blossom in spring. This policy is changing Sheffield in character, and deeply at that. Sadly, so many thousands of trees are being taken up, I have no idea if Sheffield is still one of the leaders in Europe for trees to people. I’m a Labour party member, and I can’t understand this disaster. Nor the disaster of sacrificing ancient woodland (Smithy Wood) for a service station when there is a brownfield site right next door. It’s completely heartbreaking. The council in Sheffield have forgotten their purpose, but there again that has been true for some time now. I don’t know the answer. I do know that where I live the UKIP/Labour battle is in full flow. About half of our councillors are UKIP, the other half Labour. And it’s a very close thing. I fear having no councillor whom I can approach.